The Togolese, led by Monaco striker Emmanuel "Sheyi" Adebayor, have been impressive and their form has not gone unnoticed by the corporate world. Their football federation has just signed a two-year sponsorship deal with German sportswear manufacturers Puma. The contract, which is worth over US$600,000, gives Puma the option to renew the relationship with Togo until 2010. 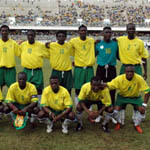 Kit will be supplied to the Hawks, Togo's national team, as from 1 January 2006. Puma is also expected to provide training facilities and technical assistance for Togo's youth teams as part of the sponsorship deal. For Togo the success of the national team could not have come at a better time. The West Africans were reeling from a bloody uprising that was sparked by disputed elections following the death of their longserving ruler Gnasibbe Ayadema. The team's fine run has given the people of this country renewed hope. "That has always been the power of football, the reason why this game is special and the reason why it is different from the rest of the sporting disciplines," said Footballers Union of Zimbabwe patron Shepherd Chiware. "If you look at the wonders being done by the Togo national team and the impact that their success have on their nation then you can understand the power of football. "Every where on this continent, football is mending bridges and I think the Angolans are a lot happier at this point in time than they have been because of the success of their national team. "Here in Zimbabwe we see it at every home game when we have 50 000 people at the National Sports Stadium and you look at all their faces, after the Warriors' victory, and you can see hope. "People forget about the fuel problems that they have or any of the social challenges that they face when it comes to the national team. "We need a new set of representatives at the World Cup finals and it feels good to realise that countries that have never been to the World Cup will now have the chance. It will be very good for our football as a continent." Togo to go out at the group stage. Topped African qualifying group 1 , ahead of favorites Senegal.